BleachHouseLibrary.ie: " SeaWAR " by Sarah Holding. Review by Mia Madden age 10.
" SeaWAR " by Sarah Holding. Review by Mia Madden age 10. The second instalment in the SeaBean Trilogy and we are back with Alice, Charlie and the children of St. Kilda and their adventures in the C-Bean. This time the machine resets itself and brings Alice back in time, to 1918 where she meets 11 year old Donald and his classmates. Spix the parrot also tags along and the adventures just keep coming and coming! Book 2 is choc-full of time travel fun and mystery and once again highlights the importance of the environment. Alice encounters a whole new life on St. Kilda and makes some amazing new friends, from different eras. We are introduced to Karla, the creator of the C-Bean and she seems to have something to hide.... Can Alice and her trusty friends figure out what her plans are for the future of the C-Bean? This book was a real page turner, with great cliffhangers at the end of each chapter. There was a lot of information to take in, so may be more suitable for age 10+, or to read aloud with an adult. Like the last book, this one has a thermochromic cover which changes colour with body heat. Seriously cool! I reviewed the 1st book in the Trilogy and my review was even quoted on the back of this one, as well as on some bookmarks!!! I really, really recommend this series as it is simply awesome and I cannot wait for the third book, SeaRISE. 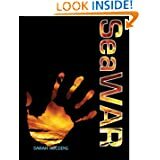 SeaWAR is published by Medina Publishing and is available in paperback or ebook format.